What a lovely day! Lots of volunteers came along today to cook up a tasty feast for each other. The plan was to make pancakes with fruit compote, but we didn't have all the ingredients we needed. Luckily, we had the farm at our disposal, so off we went to search for the rest. We began with a trip to the farmyard, to see if the hens had anything for us. It was a great haul - we headed back to the kitchen garden with eight eggs! Next we went foraging for fruit! We found some beautifully ripe purple elderberries, some juicy red apples, and some bonus plums! Once again, we headed back to the kitchen garden, and got to chopping our harvest, after washing it of course! We put all the chopped fruit in a pan and started cooking it, adding a little sugar and lemon juice. We kept a good eye on it, and after a while, added the elderberries, which turned the mixture a lovely pink colour! While the fruit was cooking, we started preparing the batter for pancakes! We cracked our fresh eggs into a bowl, and added flour, milk and a little olive oil. We took turns whisking the batter, so our arms didn't get too tired. Once all the lumps of flour had been whisked out, it was time to get the pancakes going! Our volunteers were expert pancake flippers, even while being watched by the whole group! 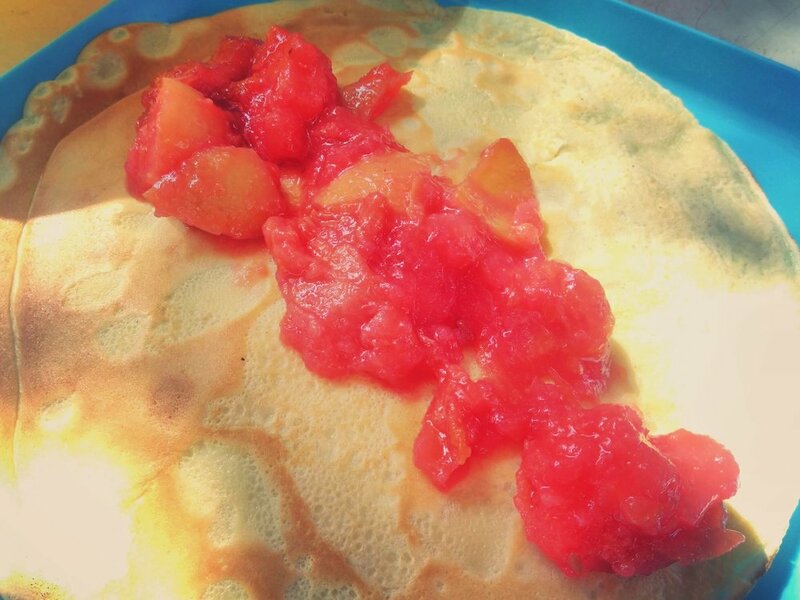 We all waited patiently for our pancakes, and excitedly filled them with our pink fruit compote! What a treat!